Why Are More Single Women Buying Their Own Apartments? In recent years, more and more single women are buying their own apartments. China's largest property listing website Ke.com analyzed second-hand apartment sales in 12 big cities for several years and found 47.9 percent of the recent buyers are women, the highest proportion in the past seven years. In 2014, the figure was 30 percent. Of these women, 74.2 percent said they did not receive any financial support from their partners, 45.2 percent were helped out by their parents, and only 29 percent bought their properties on their own. The rising trend of single women buying their apartments is now a much-discussed topic, especially on some online real estate platforms. Some believe it's a sign that women are becoming more financially capable and independent, and their attitude toward marriage is changing. With a place of their own, they will feel more secure and enjoy a more equal status in marriage. However, the skeptics think owning an apartment doesn't necessarily mean independence for women. They think it's a ploy by real estate developers to persuade more people to buy apartments. A large number of single women still depend on their parents, not earning enough to be self-sufficient. Pan Helin (The Beijing News): Due to economic and social developments, women are becoming increasingly more independent, both financially and socially. More and more Chinese women are choosing to buy apartments when they are still single. This is a reflection of the change taking place in their and their families' values, which in turn is impacting society. A direct result of this is that a lot of property developers are adjusting their sale policies to woo women as they play a bigger role in house purchasing. According to traditional Chinese thinking, houses are crucial to marriage. While men are still the majority of house buyers, why is it that women are increasingly playing a bigger role in this regard? The main reason is to cope with volatility and other risks in marriage. Women have a greater sense of security when they have an apartment of their own. According to statistics from the Ministry of Civil Affairs, in 2018, there were 10.1 million newly married couples while the number of divorced couples hit 3.8 million, and counting. In the face of this harsh reality, a lot of women have to face up to questions like who will provide the down payment on the apartment, who will be responsible for paying the monthly installments, and how the assets, especially property, will be divided if there is a divorce. In general, women depend more on marriage and their family than men. If they have a house of their own, they'll feel more secure and have higher self-esteem. As women's incomes rise, their concept of marriage is changing subtly. They are beginning to value their own personal space. They are also basing marital happiness on independence. With an asset backstop like an apartment, women are also freer to marry for love. Equal status in marriage gives them equal power in decision-making, adding to the security and stability of the marriage. Yan Yunxia (www.xhby.net): Why is there so much hype about single women rushing to buy their own apartments? It stems from a deep-rooted discrimination against women. For many years, buying an apartment was seen as a man's responsibility, and women had to be taken care of. The fact that more women are buying their own apartments implies an increase in their income, although there is still a gap between the earnings of female and male professionals. Besides, a growing number of females have begun to realize the importance of independence and their own value. They refuse to be subservient to men. A striking change is taking place in women's attitude toward marriage. Once people thought that if a man owned a house and a car, it would be a happy marriage. Today, when more women are buying their own apartments, they are liberating themselves from this kind of thinking about marriage. Is it ok to equate women purchasing apartments with independence? Real independence does not depend on material things. Besides, although many single women have bought their own apartments without depending on any male partner, some had financial support from their families. In this sense, it's wrong to equate purchasing an apartment with self-sufficiency. If this becomes a stereotype, it would be unfair to women who have not bought their own places. The phenomenon of single women buying apartments can be interpreted from different aspects but the subject should not be abused. It should also not be hyped for commercial purposes. Buying a house should never become the final goal or something to show off, as there are more important things to strive for. Caijingxiansheng (baijiahao.baidu.com): Who pays more attention to creature comforts? Women, mostly. Traditionally, it was thought that women's consumption was focused on things like branded garments, cosmetics and other daily commodities. 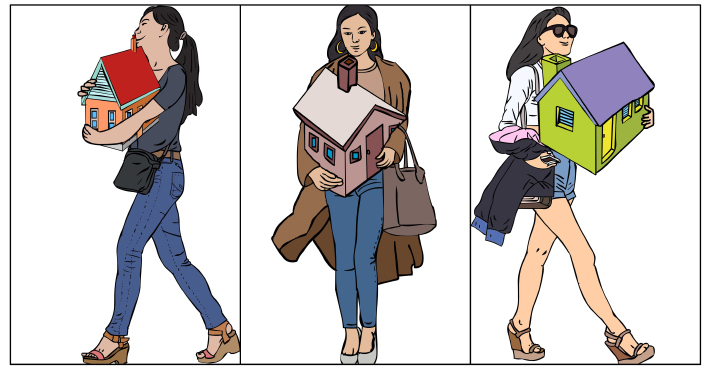 However, today's single women constitute the bulk of (second-hand) property purchasers in China, particularly in big cities. Compared with women of the previous generation, today's young women have higher financial awareness and sense. A larger proportion of women have their own business or career and are no less capable than their male colleagues. So their income is rising. Traditionally, a lot of restrictions, both tacit and implied, prevented women from taking up some jobs, including well-paid ones. However, today, more women are bravely challenging stereotyped social concepts and the restrictions imposed on them. They are now working in previously male-dominated areas like technological research and high-level business. This, in turn, has boosted their income. Today, if asked to choose between love and material comforts, what will women say? A rising number of single women's answer will be: "I have already provided the material comforts myself." They are free to say this because they have an apartment of their own. Today, it is rare for single women to give up the men they want to marry because they have no place to live in after getting married. In big cities, it's common for even young men not to be able to afford a house. If a couple buy a house when both partners are financially capable, their married life will be much easier. Deng Haijian (www.youth.cn): If they have their own apartments, women who feel insecure socially will feel more secure. If they don't get married, they will still have a roof over their head. If they marry, their apartments will ensure them equal status in marital life. Therefore, to a large extent, a house is insurance for single women's future happiness. However, this phenomenon is not worth praising to the skies. Buying an apartment does not necessarily mean financial independence and those who do not buy a house should not be written off. The topic seems to have been hyped unnecessarily. We all know that China's property market is stabilizing in 2019. At this moment, there is this talk about single women flocking to buy their apartments. It seems to imply that even women are rushing to buy houses; so men or families, why don't you also join the rush? Are you less capable then these single women? Worse still, it divides single women into two groups: those who buy houses and those who don't. Will that eventually make society think that single women must buy their own houses? Another question is, how many of these single women have bought their apartment without any financial support from their families? Or how many single women or men can afford China's eye-popping housing prices? Whether they buy a house or not, people go on with their lives. Everyone should live within their financial capability. It's not worthwhile buying a house beyond one's means and then groaning under the huge financial burden for the rest of one's life. For single women who have not bought an apartment or are planning to purchase one, my advice is, don't be swayed by the property ads. Instead, listen to your own heart.